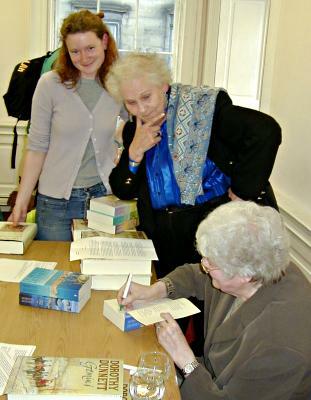 On Monday 12th June 2000 Dorothy gave a talk at James Thin's South Bridge shop in the same Events Room that we had filled with Gemini two weeks before. Despite making it an all ticket affair we still had about 20 extra people hoping to get in who mostly ended up peering round the door of the packed room. I started the evening with a short introduction, saying that 40 years ago a book had been published that changed the face of historical fiction forever - at which Dorothy recoiled in mock horror that Game of Kings had been so long ago. That relaxed the audience immediately and I handed over to her for the rest of the evening. The audience were asked how many of them had read Gemini - there were very few, so she was very guarded about the contents to avoid spoiling their enjoyment. There was a brief resume of basic plot ideas and there was the suggestion of the Scottish Plan being real but intended against only the St Pols. She mentioned her well known research travels and that she comes to know many of the places she visits very well. Gemini is of course largely based round her home area and she is fortunate that the sites of many of the Edinburgh scenes are still in existence and this was one of the great delights in the research and writing. For instance the Floory Land is still there at Jeffrey St. and records still exist of the trades of the people living there. Leith property records still exist too. Of the major historic events in the book, Fotheringay records still exist but Lauder is more confused. She came to realise during her research that the people who recorded events in those times placed no importance on facts but wrote for the present and for the political and social effects that they might have. This makes the job of historians much more difficult that it might seem. Her reading list was up to 739 books for House of Niccolo before she stopped counting. Primary sources were essential - Exchequer Records, Parliamentary Records, Great Seal of Scotland, etc. She then gave a reading - the Kathi spying scene. The section beginning and ending with: "Settling into her life as a spy..... ....... like a warmly comatose bear with a cub." and including that lovely piece of wry humour about the pigeons that were fed but also cooked. We then moved onto a Questions & Answer session - the answers here are as close to the quotes as possible though some are a little condensed as I couldn't always keep up with the flow of the discussion on my palmtop. 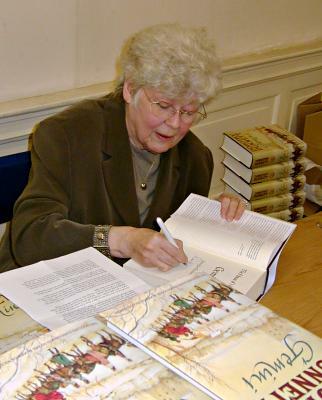 What advice did she have to aspiring writers of historical fiction? "Read a lot of it but ignore styles. It's not easy to find your own voice." What will you write in the future? "Depends when I go gaga". She said she would like to do some pure history following up on her past researches. She also responded positively to the requests for a final JJ, which of course she has already said that she would like to do to finish off the series. (The final results of that depend on the publisher of course). Why the time period of Niccolo? "Because it was still in the Renaissance, and there were the fascinating aspects of numeracy, banking, double book-keeping, and people coming up from trading classes." Where did you do the research for Timbuktu? It was too dangerous to go there and everyone was being warned off by the Foreign Office. Ironically, after finishing SoG she met someone who'd just been there on a package holiday! Fortunately there was a lot to be read on it. There will be an announcement quite soon. Negotiations and arrangements are still under way and it's not clear yet exactly what will happen. When writing Lymond had she any ideas of Niccolo? "No, the idea only came up after writing KH." There was some discussion of various internet related stuff such as the numbers of people and messages, and of the Gathering, and she mentioned having to write different speeches for each appearance now because often the details of each one has appeared on the net by the time she gets to the next one. Once there was a proposal for a 13 episode TV version of Game of Kings, but it fell through. Were you sad to say goodbye to Nick? Yes, she wrote the last words of Gemini on Guy Fawkes night. Richenda (her editor) also felt bereft at finishing it. What suggested James IIIs medical background? Related to "the madness of King George III". It has been traced back to Mary Queen of Scots, so it was quite possible that it went back further in the Stewarts. James II was known as "James of the fiery face", and there is a portrait of him which shows this - most unusual for the time. This was held by historians to be a birthmark but Dorothy suspected that it might be porphyria as it would explain his often erratic behaviour. It's possible that even Robert the Bruce's "leprosy" may be down to that, as leprosy was a name attached to a great many skin complaints. She mentioned that the period of James III was also the time of Blind Harry, which was a useful aspect. The poem about Wallace worked very much like an early version of Braveheart in stoking up passions, and was used to political effect. That being the end of the questions I finished by asking the last one - whether Richenda had guessed the ending. We resolved to ask her the following night (at a reception being held in her honour). After thanking Dorothy and wishing everyone the best of enjoyment in reading Gemini, I closed that section of the evening with a round of applause for her and we moved to the signing and chat which kept us going until 9.00pm.